Stammer's best finish was a first with Monique Oliver in 1994 at Pismo Beach. Stammer attended both St. Philips Junior College (1981-82) in San Antonio, Tex, and Louisiana State (1982-84). She was a junior college All-American and an All-Southeastern Conference performer at LSU. Stammer played Major League Volleyball and competed in the Italian Professional League. 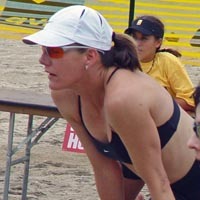 Her sister (Wendy) also plays professional volleyball.